Anticellulite body butter by BodyBoom ​​- a Polish brand that creates cosmetics and imports individual precious ingredients from all around the world. 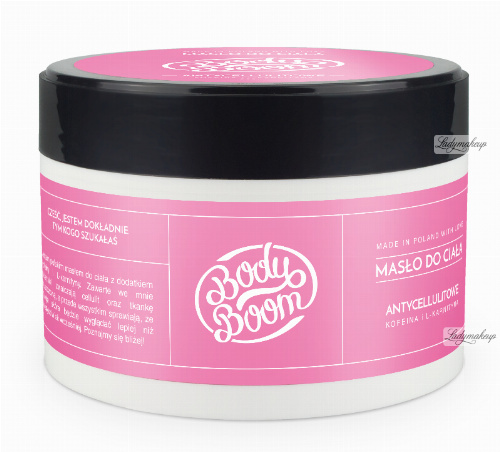 In addition, BodyBoom ​​is environmentally friendly - it does not test it's products on animals. The butter helps to minimize cellulite. Contains L-carnitine, caffeine, active ingredients, natural waxes, shea butter, as well as soybean oil. Thanks to such a rich formula, the product accelerates metabolism, reduces free radical activity and stimulates the reduction of fat cells, leaving the skin impeccably smooth, elastic and moisturized like never before. The whole was placed in a plastic jar with a capacity of 200 ml, which will be enough for a long period of time. Leaves a feeling of flawless, firm, and moisturized skin. Handy packaging will allow for a seamless application. 1. Apply to thighs and buttocks. 2. Rub the product gently with circular motions. 3. Leave on until absorbed. For best results use every day.